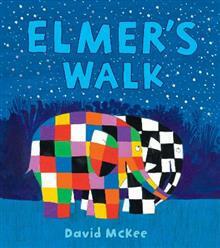 Elmer is enjoying his walk: smelling the flowers, watching the clouds, listening to the waterfall. But each time he points out one of these lovely things to the other animals, they all say they don't have time to stop. Luckily Wilbur arrives at last and shares Elmer's enjoyment i... read full description below. Elmer is enjoying his walk: smelling the flowers, watching the clouds, listening to the waterfall. But each time he points out one of these lovely things to the other animals, they all say they don't have time to stop. They're far too busy. Luckily Wilbur arrives at last and shares Elmer's enjoyment in the stars. A celebration of mindfulness from master-storyteller David McKee.